This fast-flying swallowtail can be common at times. 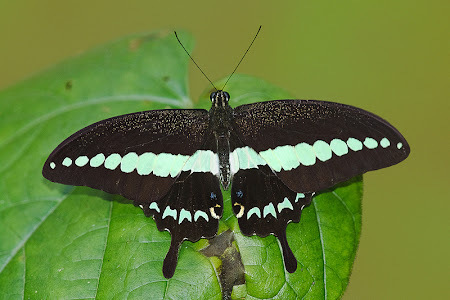 Last Sunday, I was out with young ButterflyCircle member Jonathan Soong, when we saw at least four individuals chasing each other at a flowering bush in the nature reserves. The Banded Swallowtail is usually fast-flying and skittish, but after a bout of vigorous activity and feeding, they are often observed to stop for a break with their wings open flat on the topside of leaves. Jonathan was able to take a shot of this Banded Swallowtail when it stopped to take a breather. The pale green band on the wings are well-exposed in this shot. Usually, our shots tend to be overexposed due to the contrast between the black wings and this pale green band, giving the band an almost white appearance.